Sensei Philippe is Instructor at Coredojo Academy. He currently holds a 1st degree black belt in Judo, 2nd degree in Shotokan Karate and a 2nd degree in Shinkyokushin. 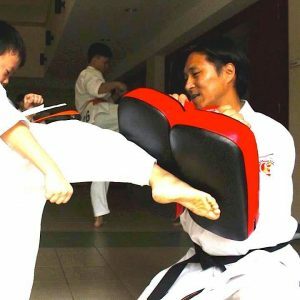 He has been practicing martial arts for more than 40 years. Philippe grew up in Marseille (France) where he started Judo in 1975. He practiced it, as a sport, for 20 years and fought in many tournaments, before moving to other martial arts (Taekwondo, Muay Thai, Krav Maga, Tai Chi, Aikido) and finally found in Karate what he was looking for. After 14 years with the Shotokan, Oshima and Shindokai Schools he converted to Shinkyokushin under Shihan Bong in 2010. He is an unconventional instructor and often come up with creative methods to teach particular topics and area for improvements. He often put emphasis on Karate applications for fitness and practical street self defense. He also holds two Master degrees and one PhD in Physics and Electrical Engineering and systematically applies Scientific principles and body mechanics in his teaching.